Aristocracy is a kind of government that puts power in the hands of a small, privileged ruling class. In Ancient Greek, the word aristocracy means the rule of the best, but it has come to be linked with rule by royal families. There are different kinds of aristocracy with different ways the government is set up. In history, most aristocracies are hereditary. 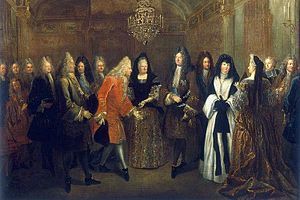 Members of the ruling group have passed on power to their eldest surviving son, and sometimes to their eldest daughter. Aristocracy can be combined with other kinds of government. There were small groups of people that run a country. The people were called aristocrats and often had titles such as duke, duchess, baron and baroness. monarchy - (inherited rule by a single individual) The monarch and his or her relatives are usually the aristocracy. Also, the monarch has the power to make anyone he or she chooses part of the ruling group. Sometimes the current monarch is replaced by another aristocrat and their family. autocracy - (all power in one person) Aristocracies in an autocratic society tend to be very small, usually only the autocrat's family or close friends. plutocracy - (rule by the wealthy) The aristocracy is usually made up of the richest people. Sometimes it is not enough just to be rich, you must also be from a special family or ethnic group. oligarchy - (rule by the few) All aristocracies are also oligarchies. meritocracy - (rule by those who most deserve to rule) The aristocracy is usually a group of people with special credentials or those who went to a particular school. It is possible to lose your place in the ruling group because someone with better skills replaced you. democracy - (rule by the people) There are usually not official groups of aristocrats in a democracy. However, rich and famous people sometimes informally form a group of people who get special treatment with the consent of everyone else. ↑ "Aristocracy". Oxford English Dictionary. December 1989. Archived from the original on June 29, 2011. https://web.archive.org/20110629022358/http://dictionary.oed.com/cgi/entry/50011987?single=1&query_type=word&queryword=aristocracy&first=1&max_to_show=10. Retrieved December 22, 2009. This page was last changed on 2 March 2018, at 06:36.